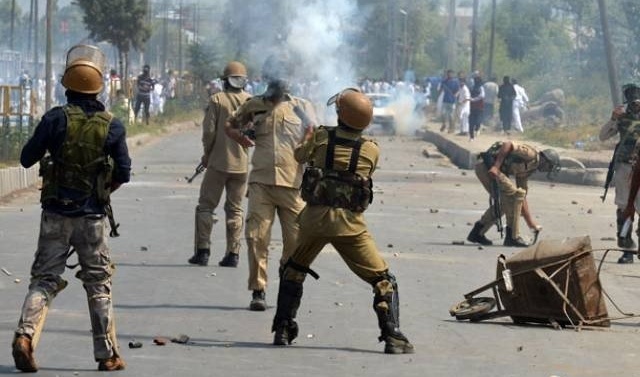 SRINAGAR: Suspected militants fired a grenade Thursday at the motorcade of a local politician in Indian-administered Kashmir, killing three bystanders and wounding at least 20 others, police said. The attack occurred as Nayeem Akhtar, a local government minister, was passing through the southern town of Tral. He escaped unhurt. “Three civilians were killed in the attack. We are investigating,” director general of police S P Vaid told AFP, adding it appeared a grenade launcher was used to fire the explosive. At least 20 people, including 10 government forces personnel, were also injured in the blast in the disputed Himalayan territory, he added. At least 140 armed militants, including some senior commanders, have been killed since the start of the year by government forces. Militant ranks have swelled since security forces shot dead a hugely popular rebel commander, Burhan Wani, last year. Wani was a native of Tral where Thursday’s attack was staged.